There is a huge number of articles available these days about Google Wave. Some of them describe various features that are yet to be and already are implemented in this astonishing new technology. What I would like to share in this post is our impressions from using Google Wave. Our Sitevalley team got sweet opportunity to get an invitation to use Wave Preview while it is still not freely available to everyone and for this we would like to thank Google a lot! From very start it was a big load of fun to play with waves and actually most features are still not clear enough for us. Here you will find a few feature reviews, some basics about the conception of Google Wave and several personal impressions we got when using it. I also attached a nice extension list and cool video for those who is starting to use Google Wave or is at least interested in doing so some time soon. So what is Google Wave? As officially stated it is a real-time communication platform. This name actually includes more than it initially may seem. Such natural to most of us things as email, instant messaging, wikis, web chat, social networking, blog, forum, project management and probably more in future, are all centralized and comfortably (eventually) organized in one web based client called Google Wave. It is designed for literally anyone. It suits well for personal, corporate or any other use you can come up with. When we played with it we acted more as regular internet users rather than staff of a hosting company. First of all the code is open. This will hopefully ensure rapid and widespread development of this platform. Intuitive interface which looks very similar to any email client. There should be no problems getting used to it, at least all members of our Sitevalley team came to this conclusion (you can take a look at the interface in the video located in the bottom of the post). Capability of embedding waves. Waves can be embedded on a website or a blog, which gives an easy to use UI to regular users and simplifies the code for developers. Extensions and Applications in Google Wave. 3rd parties can create unlimited number of gadgets, extensions and bots for Google Wave which makes it extremely flexible and feature rich. This feature reminds me of Firefox, Facebook and iGoogle all together. Wiki functionality. All participants of the wave can edit and improve it. Advanced “smart” spell checking engine, which was specially developed for Google Wave. Centralization. All wonderful features are brought together within one web interface which you can access from any PC or laptop. Real Time. Almost any changed introduced by participants of the wave can be seen by others right away. Of course there are way more features than described in this list. But to see them all you will definitely have to try Google Wave for yourself. The best place to start learning more information about Google Wave is of course the official site. A wave is main building brick of Google Wave. It is a threaded conversation with the least number of participants being one. Unlimited number of participants including both humans and robots can be added to a wave. This wave is not a static message like an email one but it is rather a dynamic unit that carries both the current state of itself and its own history at the same time. A wave can be modified at any moment by any of its participants and these changed will be immediately seen in the current state of the wave plus the previous actions will be stored in the history of a wave. Wave contains one or more wavelets. 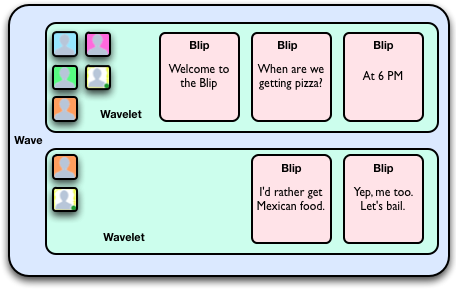 A blip is the basic unit of conversation. It carries a single message which appears on a wavelet. Blips have two states: drafts or published. Blips have documents attached to them. A document carries the content which blip manages. For more information on the wave elements see Google Wave API Overview. As well as a message in a form of a blip you can add an extension to wave. This is a mini-application that “lives” inside of the wave. It is not added to a user like in Facebook , it is added to a wave itself. There are two different types of extensions in Google wave. First one is a gadget. This is a type of application every participant of a wave can interact with. A lot of gadgets are built on Google’s OpenSocial platform, which means that a great number of gadgets from iGoogle will work with Google Wave. Gadget can be a game, a conference, a map or anything else you can come up with. For example the developers of Wave designed a special “Yes, No, Maybe gadgets” that helps organize group events by processing who will go, who won’t and who is not settled yet (it can be used not only for events but for opinions too for example). I enjoyed playing the Sudoku Gadget as a great way to waste time =). Normally you can add a gadget either using a special wave that hosts all the gadgets designed specifically for Google Wave or you can use a regular URL. For more information about gadgets see Wave Gadgets Tutorial. The second type of extensions is a robot. You add a robot to a wave as well as other participants. You generally do not interact with a robot as with a regular gadget. Robot automatically does what it is meant to do in wave by a creator. A good example of a robot is “Polly the Pollster”which turns a wave into a Poll. This robot can be found at polly-wave.appspot.com/about. For more information about robots see Wave Robots Overview. All in all it was pretty easy to get started with Google wave. The first thing I did – created my first wave as there is almost nothing you can do without having a wave to do it in. And of course as I just started there was not a single participant except for me, which was not boring in the beginning as I started adding gadgets and playing with them. So after I studied a little of geography with the map gadget and checked out few games like Sudoku I decided to add some pictures to a wave. Adding a picture was pretty easy – just a regular attachment. I also tried dragging and dropping as was announced by developers, but this didn’t work neither for me nor for any other member of our team, probably because the Wave is still in development. Then I tested the nice feature of embedding a video from Youtube with the help of “Linky” gadget shown in the Video Presentation of Wave and it worked pretty good, while attaching my own video didn’t go as this smooth (to be honest it failed completely). So after playing with gadgets I finally added few members of our Sitevalley team to my contact list and here is where fun began. We created several waves and from the start felt the awesomeness of the collaborative exploration of new technology. I would really like to point out that using a wave as a regular instant messenger was quite weird in the beginning. I am pretty used to instant messengers where you have to hit Enter for a contact to see what you typed. So in Google Wave the situation is completely different. Every participant can see what you are typing from very first second (when it is not dragging, which it unfortunately still does) so there is no use to even close the blip when you are done as the person on the other side has already seen your message. So eventually you are released from extra actions of hitting enter in the end of your message. This is just an example of the enhancements brought by the Google Wave. What was really tough in the beginning is figuring out how the extensions work. It was also weird to add extensions in a form of a contact. Here is a list of useful extensions for Google Wave we came across that will make using it more productive. The most fun comes in when you use Wave with participants as it is meant to. Using the gadgets and robots together is not only productive but actually pretty pleasant. Media content is represented extremely comfortably. Photos have a kind of a special gallery for viewing – very handy, unlike the photos in e-mails in my opinion. Plus you can embed the wave with all the media straight to your blog or a website which is terrific! Our team and I are very satisfied with what we experienced when using Google Wave. Most features described in the wave presentation video are working pretty good, though some are still inaccessible. Sometimes the wave was slow , it actually depended mostly on the amount of wavelets in a wave and amount of additional extensions added to a wave. Hopefully overall slowness and glitches with video uploading will be fixed in the release version of the wave. All in all the UI is very friendly, intuitive and convenient. The functionality of Google wave is definitely huge and will keep getting bigger with every single user contributing to its development. The overall productivity of Google Wave depends on the number of people using it – the more the better as with a lot of participants the true potential of this platform gets uncovered. The only huge disadvantage i have found in Google Wave is impossibility to send and receive regular e-mail messages with it so far. 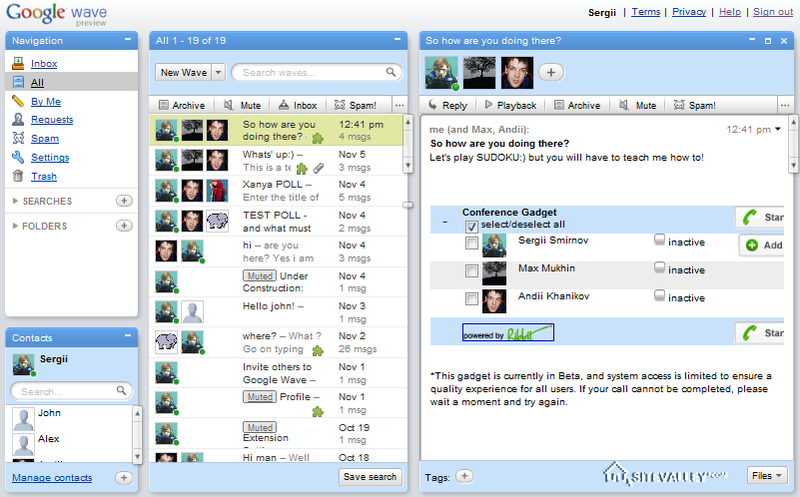 But according to latest news extensions that will add this functionality to Google Wave are currently being developed . I must say that Google Wave is definitely worth trying.